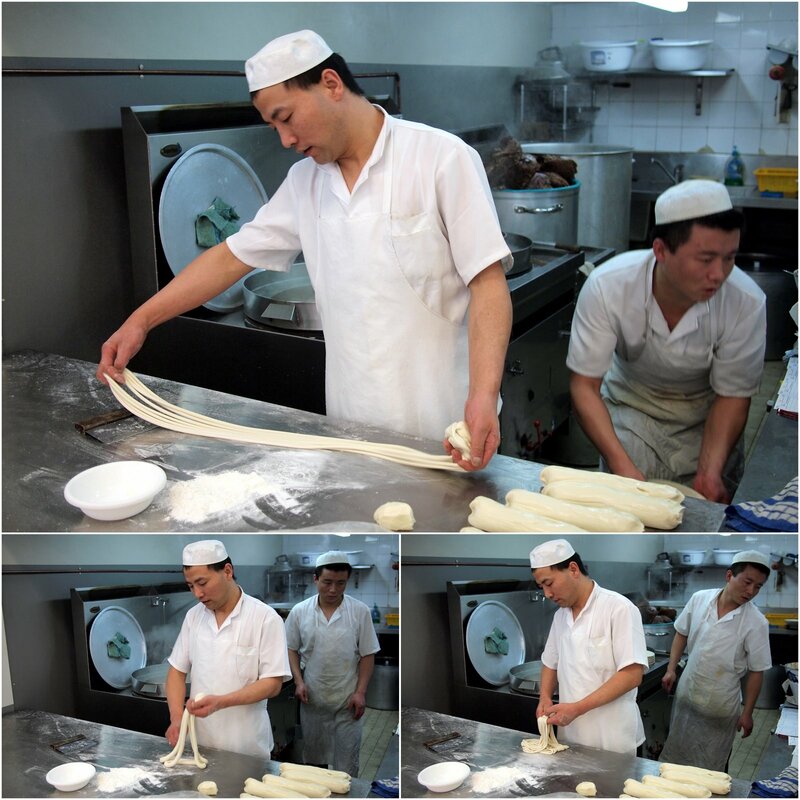 China Noodle King at the Chinatown end of George Street makes handmade noodles right in front of your very eyes. We first visited this spot some years ago. It was run by a lovely family: the kids would serve you in their school uniforms, mum loved to have a chat and dad loved a visitor out the back in the kitchen on the way to the loo. 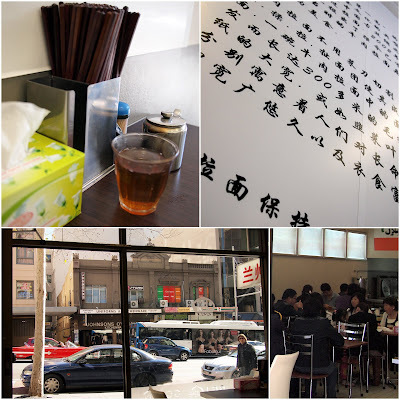 We used to really like their handmade noodles, stir fried chopped pancakes and cumin beef pancakes. Alas these folks sold up and moved on. The next owners were overly keen on oil and salt so the joint kind of slipped off our radar. Fortunately the restaurant changed hands again and current owners are really on the ball. The food is from Lan Zhou in north western China. The folks are muslim so the food is halal. They wisely demolished a wall so the kitchen is open and you can see the master noodle makers at work. I was drooling at the huge stockpot overflowing with bones and protein in the background. A tick in every box: condiment set, tea on arrival, wall menus in Chinese, Chinese punters and a great window for watching the world go by. Three kinds of vegatables, $6. A lovely cold side, strong flavours, a bit much for one person, a dish best shared (Miss Chicken is working today so I am out unsupervised). I could identify carrot and kelp and maybe some cabbage, a mystery salad. Noodles with beef gravy. $10. The beef gravy was a dollop of salty sauce that reminded me of black bean sauce, with a few small but tastey pebbles of beef. It was served on thin wheat noodes with sliced cucumber on top. This dish was OK but didn't set my taste buds on fire. It seemed well made but wasn't what I was expecting: I was after 'Schezuan Spaghetti' - thick chewy handmade noodles with minced meat, an old favourite of mine. I looked around the room and other folks had lovely thick handmade noodles, I had simply ordered the wrong thing, this is what happens when I go out unsupervised! The side soup however was amazing. It had a little cloud of debris in the middle like Japanese miso soup often does, and it tasted of spices which were familar, but I couldn't put a name to them. Perhaps I was supposed to pour the soup onto the noodles, this would have made the noodles less bland but the soup was just too dang tasty to pour on noodles. I forgot to photograph the menu but here's a couple of mystery specials on the front window. I wasn't over the moon about my lunch but I think I just ordered the wrong things. I was drooling over some of the other punters' meals: thick, chewy handmade noodles; kebabs of grilled meat, oh yeah, I'll be back. China Noodle King is at 800 George Street, Chinatown. I walk home and pay my respects to the happy drunken ghosts from the old Carlton United Brewery. There's nothing like a bit of urban decay on a beautiful sunny Sydney winter day.